The MSA 200 C-BQ offers 30% more cutting performance compared to the MSA 160 C-BQ and a bigger cutting diameter by accomodating up to a 14" blade. 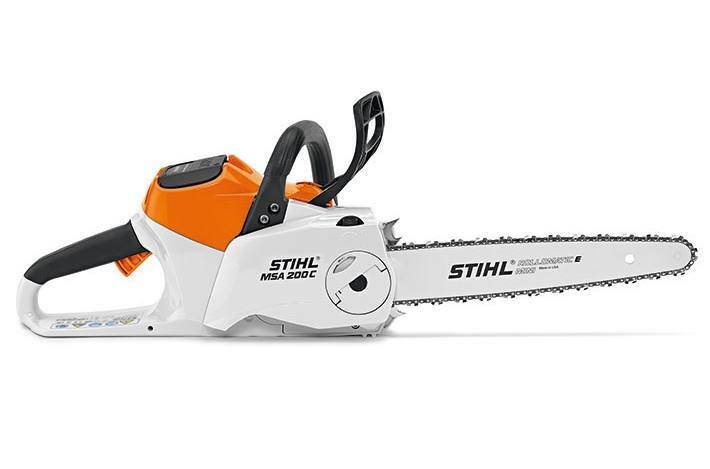 This unit is ideal for landscaping and tree pruning jobs, cutting firewood and for working indoors or in noise sensitive areas. 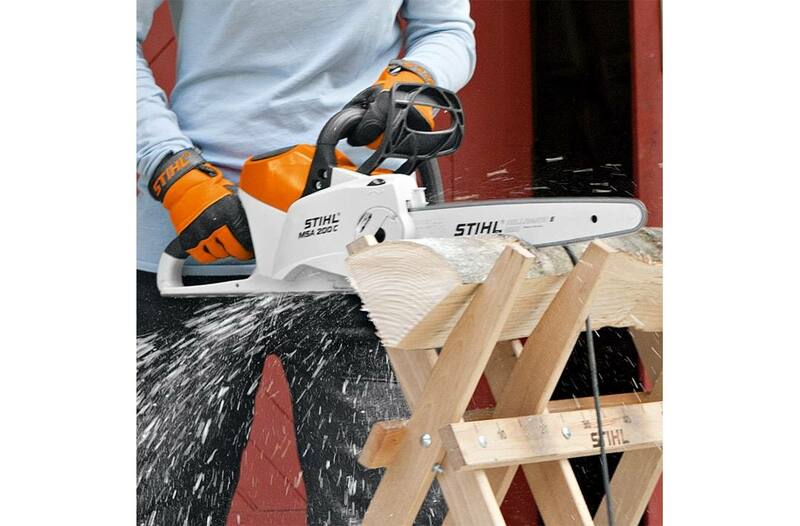 Another innovative product only from STIHL. Battery and charger sold separately. QuickStop Super Chain Brake (Q): The additional braking system for extra safety. Users can trigger the chain brake directly at the rear handle. The chain stops in seconds whenever the user lets go of the rear handle and whenever there is sufficiently strong kickback or when the front hand guard is activated. This unique safety feature ensures even more user protection in all working positions. Operating handle: The black soft component on the rear handle provides a secure and firm grip in all working positions. Two-handled operation: The ergonomically shaped handle and rear control handle with comfortable soft-grip component ensure safe working in all operating positions. STIHL Chain Quick Tensioning (B): The STIHL chain quick tensioning system (B) makes it very easy to tension the chain. Just release the sprocket cover and turn the knob to set the optimum tension. No tools needed. 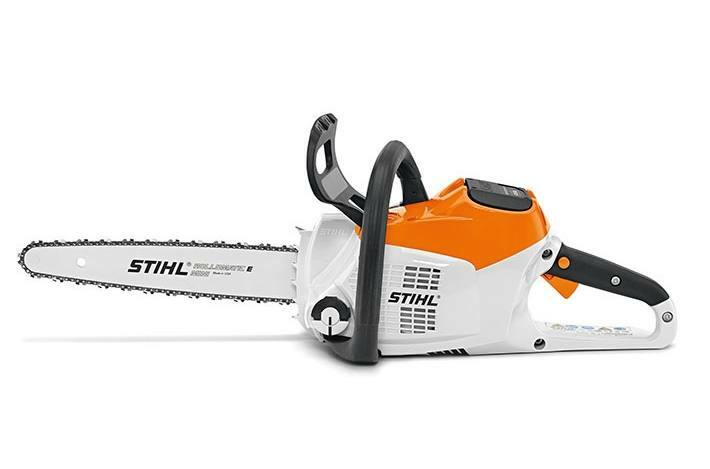 STIHL Electric Motor (EC): The STIHL electric motor (EC) is extremely energy efficient, lightweight and compact. It runs quietly, generates very low vibrations and does not require servicing. Ematic chain lubrication system: The STIHL Ematic chain lubrication system provides maximum lubrication, longer wear and less oil consumption that conventional methods of chain lubrication. The oil consumption can therefore be reduced by up to 50%. Toolless filler cap: The tank can be filled quickly and easily using the toolless filler cap. 1) without battery 2) Approx. time running at continuous full power The version(s) available in each country may differ from the above range and specifications; specific details may be subject to change without notice. 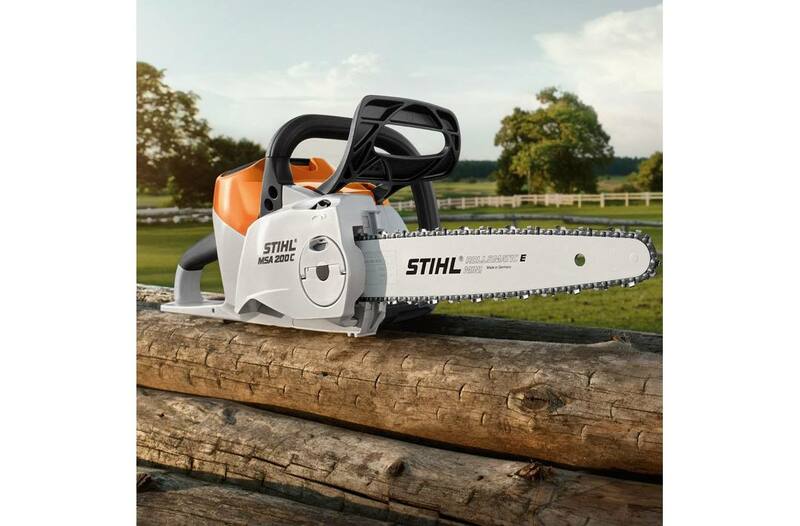 Please ask your local STIHL Approved Dealer for further information.